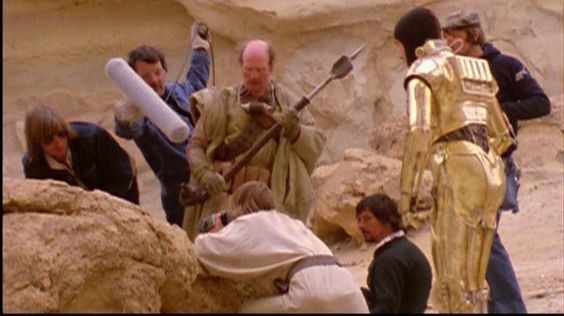 STAR WARS AFICIONADO WEBSITE: 'STAR WARS' AT 40: STUNT MAN CHALLENGE! 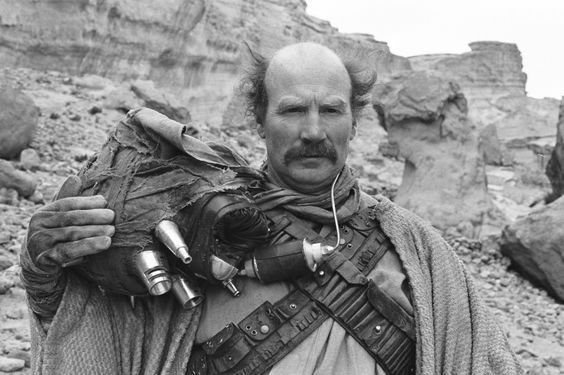 Peter Diamond on location in Tunisia. Right from the film's opening frames, the original Star Wars would be an action-packed adventure indeed. Bringing that adrenaline charged spectacle to life, from the corridors Rebel Blockade Runner to those of the labyrinth-esque Death Star, its incredible to believe that during the five month filming that there were really only three regular stuntman working on the film at Elstree Studios. A British film and TV veteran of the stunt world, Peter Diamond would be the tried and tested Stunt coordinator and lead stuntman for George Lucas's opus, performing many memorable scenes in the film within a variety of character guises- at first, he was the only stuntman out in Tunisia in March 1976, playing the Sandperson that attacks Luke Skywalker, though he would be joined a month later in London by colleagues Colin Skeaping and Reg Harding, a combined presence soon affectionately known on set as 'The Three Stooges'. The trio can be best seen as themselves primarily in the Death Star prison area battle scene, where they play Imperial troopers gunned down by Luke, Han and Chewie. 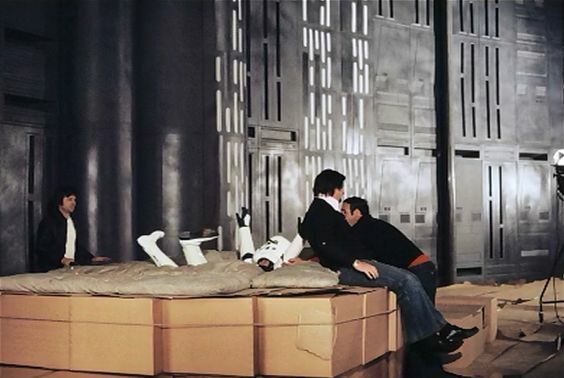 Diamond rehearsing his scene with Mark Hamill and Anthony Daniels. Most importantly, however, it was Diamond that choreographed and oversaw the very first lightsaber duel for the saga- between Sir Alec Guinness's Obi-Wan Kenobi and Dave Prowse's Darth Vader, setting the duelling standard and use of the unique ancient weapons that continues to this day. Diamond as the Stormtrooper that falls down the chasm shaft.